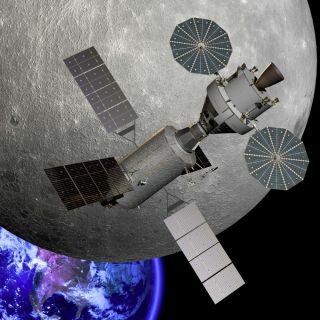 This artist's illustration shows NASA's Orion capsule near the far side of the moon. NASA has funded the development of a dozen new technologies that could help humanity extend its footprint out into the solar system. The propulsion grants are worth $400,000 to $3.5 million per year per award for up to three years of work, NASA officials said. Three companies received awards: Texas-based Ad Astra Rocket Company; Aerojet Rocketdyne of Redmond, Washington; and MSNW LLC, which is also based in Redmond. Ad Astra is probably best known for its VASIMR propulsion system, which is still in development. MNSW is working on a nuclear-fusion rocket in addition to its own electric-propulsion system. The NextSTEP habitat projects aim to help develop modules to augment NASA's Orion space capsule, which is being designed to support a crew of four astronauts for three weeks in deep space. NASA wants these additional systems to boost that capability to 60 days in Earth-moon space, with the potential for scaling up for a mission to Mars. The small-satellite grants intend to encourage the development of cubesat missions for possible inclusion on the first flight of NASA's Space Launch System (SLS) rocket in 2018. These contracts are worth $1.4 million to $7.9 million each, NASA officials said. Awardees are Lockheed Martin Space Systems and Morehead State University, which is located in Kentucky. NASA is developing SLS to help get astronauts to deep-space destinations. The rocket's first flight, known as Exploration Mission-1, is slated to launch an unmanned Orion on a journey around the moon and back.